Beta LT Jacket - Mens is rated 4.1 out of 5 by 16. Rated 5 out of 5 by floormat from Light and durable When trying this on I was blown away that it's Pro shell. It's light and feels like Paclite or Active shell. The fit is definitely on the slimmer side for me. I'm 5'10" 180 pounds and squeeze in to a medium with almost no room for a fleece mid layer. I've had this jacket in terrible rain for about 20 miles on South Manitou Island in Michigan for a week where the jacket was covered in bug spray and mud and performed just fine. Never soaked through but definitely got hot in there. After being balled up, packed, and smashed, a quick wash took care of everything and looks brand new. I wouldn't expect anything less. Highly recommend. Rated 5 out of 5 by Mark from Excellent Quality, No Surprises I required a robust, light-weight hard-shell for commuting and bike-packing. I received the Beta LT jacket a few weeks ago and it has instantly become my go-to riding jacket. It fits slim - I'm 6"2", 200 lbs and the Large size is adequate for a thin, down layer (I wear a Mountain Hardware Ghost Whisperer) or fleece. Anything more would require a size up. Although the jacket is snug, the design allows ample movement and I never feel confined, especially around the shoulders and arm pits. The hood is functional and highly adjustable. As with any technical garment, the test will be whether the design stands up to daily use. I will update this report after a few months. For now, highly recommended. 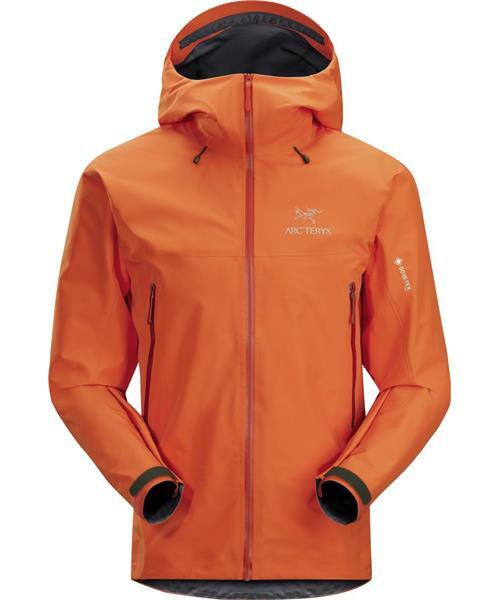 Rated 5 out of 5 by Thomas from Excellent, functional and lightweight hardshell Love this jacket. Gore-tex PRO provides shelter from the rain, and the light weight fabric means you can always carry it with you - doesn't take up any space in your pack. As all Arc'teryx products, you got everything you need, and nothing you don't need: Hood just fits, long sleeves that stay with you during activity and also made a Medium fit me (6'2"/188cm slim/athletic) snugly but nicely - without getting short on the arms. Well done! The pockets are great, and the little extra length in the back helps keeping you warm and dry. I've used the jacket for everything from hiking with/without backpack, crosscountry skiing, alpine skiing to just everyday, rainy day wear. Where I live, it rains often and A LOT, and this jacket keeps me nice and dry every time. It also keeps well against wear. Love it. Bottom line: For a short cut, long sleeved, functional and lightweight hardshell, look no further. Rated 5 out of 5 by Jonathan from 2014 Beta LT is a WIN. Love my Beta SL for around town urban escapades in the wet. As well its proven its worth in the more rugged terrain. When I decided to upgrade and get a more aggressive Goretex piece I opted for the Beta LT for its Pro Shell fabric. I must say, layering my Atom LT under it is just as nice as under my Sabre SV. I wear size Large in Arcteryx. Arcteryx products are so incredibly designed, working seemlessly together! The cut of the Beta LT is very nice, the hood is a bit larger than the Beta SL and it fits just ever so much larger for better layering. I'm looking forward to putting it through more paces, but so far so AWESOME. Worth every penny, fit and finish is just so much better than any other competitor out there! Rated 4 out of 5 by afccoyg from Great multi-purpose jacket but the fabric is beginning to pill... I've had the Beta LT Jacket for a couple months now and I am quite pleased with it. This jacket effectively sheds snow and cuts out the wind while being completely breathable. When climbing, a harness fits comfortably without the jacket riding up (even though it does not have the HemLock feature). Size S fits me perfectly (5'8", 150 lbs) but with enough room to layer an Atom LT Hoody and a base layer for colder weather. My only complaint is that the face fabric isn't the most durable in some areas. The fabric underneath the velcro straps has begun to pill and there are also a few fabric snags near the front zip. Although these areas aren't particularly important, I'm still disappointed in the quality given the high price tag. This jacket is in my regular rotation so I use it at least twice a week. Overall, the jacket performs well. I just hope the durability holds up. Rated 4 out of 5 by MeatballOne from A piece to survive & thrive in (but not quite magical) I was obsessed w/ purchasing the Beta LT after spending a great deal of time researching the cream of the crop of shells spec'd for fast & light backcountry pursuits. This research was based on ploughing through most of the material found online as pertains to relevant textile science and backcountry performance testimonials related to shells (soft & hard). On paper, the Beta LT was what I had to have. I've owned the jacket for approx. 3 months now and have attempted to wear it everyday since then to come to terms w/ its pros & cons--and ascertain if my relatively hefty investment in this trophy piece was well placed. I've worn this shell in the temp. range of -5C - +13C, w/i which there prevailed a wide variety of wind (incl. gale force), rel. humidity, and precip. (rain & snow) conditions. Pros: -Looks flattering in casual urban setting. -Don't find myself being part of a mainstream brand horde (name your mainstream brand) - nice in an urban milieu. - Layers perfectly w/ baselayer + 60 g/m^2 Core-/Primaloft / or down equiv. + 100 microfleece. (little room for much more when remaining agile). -Great fit when only wearing baselayer or above combo, i.e. not baggy. -Definitely rainproof and Np40 face fabric dries fast when wetted out. -Windproof. Minimal convection at waist thanks to hem draw cord and drop-back hem. -Non-obtrusive when engaged in highly mobile and arm flailing pursuits. -Fantastic length of arms (Ape index: 2cm/1.011). -Hood and cuff adjustments are excellent. Storm hood is very good. -Packability is great, especially given fabrics proven durability/abrasion resistance (per gained personal experience). -I really like the chin guard. Offers superb weather protection and is comfortable. -Pockets remain dry during extended (hours) deluges. -I've played rough 'n tough w/ this jacket and it still looks as good as new. Plenty rugged and durable indeed. (Possible) Cons: -I become aware of 'breathability' issues only really when signs of apparent deficiencies arise. Hence, I was surprised that the inner surface of the shell was soaked (and I mean soaked) on several occasions after I had been walking or hiking very quickly in temp. ranges of -5C - +10C for durations of 40 min. - 3 hrs, while always aggressively and proactively managing my underlying layers to minimize overheating and concomitant perspiration. Maybe this is par for the course - or even better than such - but I must admit that I was somewhat underwhelmed each time I discovered the wet film of perspiration on the shell's inner face. Given, I might be misinterpreting this phenomena as a sign of the jacket's limited ability to manage the moisture I produce, and that such drench is in fact to be expected as part and parcel of the way this jacket is designed to 'breathe', i.e. such wetness merely reflects the first stage of the water passing through the membrane. Yet even with cooling down periods of some 30-60 min. after heightened activity levels, the inner surface remained wet. Perhaps this surprised me the most--I expected such wetness would have moved out through the membrane. At times, I tried putting on a lightweight belay jacket (e.g. Rab Xenon) over the shell during periods of inactivity (thus shifting the dew point) but the film of wetness persisted even after 30 minutes. -In light of the above I wish the jacket incl. pit zips. If I'm down to just wearing a baselayer under the shell when I'm hauling fast in the rain and wind - and it's slightly above freezing outside - I don't see much option for dumping heat and remaining dry other than to vent under my pits. As it stands in such conditions, the shell often gets uniformly slick on the inside from my perspiration. Dilemma indeed. -The front zipper doesn't run smooth but sticks and chokes at repeating lengths along the pull. The front zipper's friction along tthe length of the pull is highly variable. I find this most irritating. No such issue exists with the pocket zips--they're smooth and fast. I'm not sure if this variable stickiness is par for the course/model or an imperfection found in just my jacket. I thought the pull might get smoother after a few months of usage but it continues to choke up along stretches of the pull. -I've washed the jacket according to instructions (Grangers Performance Cleaner) after approx. every other longer backcountry sejour (5 so far). I've yet to reproof. The beading of water is variable over the jacket. After longer periods in the rain (>20 min. ), I find that large surfaces of the outer fabric have pretty much wetted out and I consider the jacket's face fabric to be soaked. If I get back inside after such a downpour, shake off the jacket, and hang it up then it's dry in under an hour. But to be sure, none of the precipitation leaks through the jacket when in a deluge. Even the pockets are dry as bone. Summary: The jacket keeps me warm and dry in fiercely windy and precipitous conditions, allowing me to keep moving in good comfort during strenuous long haul backcountry pursuits in Norway & Sweden. I now carry a small and lightweight packtowel for when I stop for breaks after strenuous activities. I use it to gently blot up the accumulated wetness on the jacket's inner face so that it's not absorbed into my baselayer or thin microfleece. This then for when I'm out for days at a time and carrying but a minimum of redundancies. I can't afford to have perspiration 'back-travel' from the inner shell face and absorb into my limited layering pieces i.e. my microfleece and/or baselayer (which btw is currently an Arc'teryx Phase. It's downright magic - a review on that at a later date). I really like the Beta LT and would highly recommend it for backcountry protection when wind and rain combine forces to present an extremely mean and nasty onslaught. Any degree of exposure less menacing than this is a cakewalk for this piece of cool & function-driven gear. Rated 5 out of 5 by SuperD from FREAKING STELLAR JACKET! I have used my Beta LT jacket now for 7 years. 3 of those years it was my ski jacket with heavy use skiing 4 days a week. Backcountry, ski instructing, etc... It is super light weight, excellent waterproof, great breathability and a comfortable fit. I take it everywhere with me, every season. Perfect summer jacket for high country mountaineering, solid winter jacket for those warmer days. Not super durable fabric but light weight and packable is the tradeoff. If you want a light weight do-it-all jacket then your search is over! Rated 4 out of 5 by Yeti from Good jacket, works well with Harness Love My Beta LT, The Thalo blue is a good colour to. The fit comes up small so if you want thicker layers under neath Size up. Hood is effective and works well with Hemet, Its a little short so consider using with higher wasted waterproof trousers. I've put some thicker utility cord on the zippers to make it easier to use with Gloves, kept me dry on Long exposed belays and multi dayers!